the level of the sea, which serves as the datum used for measurement of land elevations and ocean depths. Theoretically, one would expect sea level to be a fixed and permanent horizontal surface on the face of the earth, and as a starting approximation, this is true. term properly applied to the crest of a tide as it moves around the earth. The wavelike upstream rush of water caused by the incoming tide in some locations is known as a tidal bore. ..... Click the link for more information. , their Japanese name, or seismic sea waves.) Numerous schemes have been proposed to harness the earth's tides, especially in various estuaries, as a practical source of power, but none as yet have proved economically or technologically feasible. Tides are raised in the earth's solid crust and atmosphere as well as in the oceans. Every body in the universe has some tidal effect, however small, on every other body. This effect is directly proportional to the mass of the body causing the tide but inversely proportional to the cube of the distance between the bodies. The earth's nearby moon is about 2.17 times as effective as the more massive sun in raising tides on the earth, even though the sun exerts a much greater total force on the earth than does the moon. Thus, the moon's proximity explains its dominant role in creating tides. At any given time, there are two high tides on the earth, the direct tide on the side facing the moon and the indirect tide on the opposite side. As the earth rotates on its axis, the location of the two diametrically opposed tidal bulges varies on the earth's surface. The earth's rotation and the moon's revolution, which have the same direction, bring each point on the earth opposite the moon once every 24 hr and 50 min. Therefore, the average interval between direct and indirect high tides is about 12 hr and 25 min. In many places along the Atlantic coasts of N America and Europe, the two daily low tides are of nearly equal duration and magnitude, called semidiurnal tides. In certain shallow seas and narrow estuaries, the tides differ from this simple pattern. For example, in certain regions such as the Pacific coast of N America, one of the two daily tides is appreciably higher than the other or the interval between successive tides is unequal; these are called mixed tides. In other regions, such as the Gulf of Mexico, there is only one high tide per day called a diurnal tide, with a period of 24 hr and 50 min. The range of the tides is the difference in sea level between high and low tides. Spring tide, having the maximum range, occurs during the full moon when the earth is between the moon and the sun, and new moon when the moon is between the earth and the sun. At these times in the lunar cycle when the moon, earth, and sun are aligned the condition is known as syzygy. The term king tide is used in some regions to describe the highest tides of the year. Neap tide, having the minimum range, occurs during the moon's first and last quarters, when the moon, earth, and sun form a right angle. The typical tidal range in the open ocean is 2 ft (0.61 m) but is much greater near the coast. Tidal ranges vary around the world and average about 6 to 10 ft (2 to 3 m). The world's widest tidal range occurs in the Bay of Fundy, in E Canada, where the sea level changes by 40 ft (12 m) during the day, while the Mediterranean, Baltic, and Caribbean Seas are relatively tideless. ..... Click the link for more information. , a tidal surge can occur, causing coastal erosion, flooding, and damage to coastal cities. Detailed prediction of ocean tides from theories of classical mechanics and hydrodynamics has not been entirely successful, largely because of complications introduced by the irregular shape of the ocean basins and coastlines. Useful results are obtained empirically by analyzing records of previous tides at a particular location to predict future tides. The importance of tides for maritime activities has prompted the compilation of tide tables for harbors, which give the time and height of high water and low water based on past observations and corrected for the varying positions of celestial bodies. See A. C. Redfield, Introduction to Tides (1982); D. Arnold, Tides and Currents (1987); G. Marchuk and B. A. Kagan, Dynamics of Ocean Tides (1989). a periodic fluctuation of sea level (ocean tides) caused by the gravitational attraction of the moon and sun. Deformation of the solid body of the earth (bodily tides) and fluctuations of atmospheric pressure (atmospheric tides) are caused by the same gravitational attraction. The gravitational action of the moon or sun produces tide-generating forces that represent the difference between the moon’s gravitational force acting on a particle—an element of the mass of water, earth, or air— located at any point on earth, such as on the surface, and the moon’s gravitational pull on a particle of the same mass at the earth’s center (see Figure 1). These forces are proportional to the mass of the moon (m) and the distance from the center of the earth (r), and inversely proportional to the cube of the distance from the earth to the moon (R); they also depend on the zenith distance of the moon (z). where G is the gravitational constant. The force of gravity on the earth’s surface diminishes by 0.1 milligal, or by 1 X 10–7 of its own magnitude, when the moon is at its zenith or nadir, and increases by half this magnitude at the places on the earth where the moon is rising or setting at the moment under consideration. The tide-generating force produced by the sun is determined analogously, but because of the great distance (despite the significantly greater mass of the sun), this force is 2.16 times smaller on the average. Because of the earth’s diurnal rotation and the movement of the earth, moon, and sun along their orbits, the tide-generating force at each point on the earth’s surface changes continuously in time and is never repeated exactly. 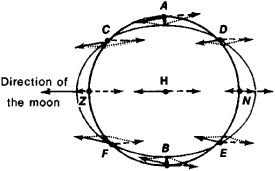 Tidal forces may, however, be represented as the sum of a large number of strictly periodic components determined from the theory of movement of the moon around the earth and the earth around the sun. The tables compiled by the British scientist D. Cartwright (1973) contain about 500 items. These periodic tidal forces are divided into four types. Long-period tides produce the greatest fluctuations of level surface at the poles, half this value at the equator, and no fluctuation at latitudes of ± 35.3°. Long-period tides include tides with intervals of 18.6 years, one year, six months, one month, and two weeks (Mf). These tides periodically change the oblateness of the earth and the earth’s polar moment of inertia and angular velocity of rotation. Diurnal tides arise as the result of nonconformity of the equator’s plane with the plane of the lunar orbit and the ecliptic plane. They produce the greatest rises and falls of bodily tides at latitudes of ± 45°and no changes at the poles and the equator. The chief diurnal tides are the lunar tidal constituent O1 with an interval of 25.8hours and the lunisolar constituent K1 with an interval of 23.9 hours. Semidiurnal tides produce maximum rises and falls for static tides at the equator and no changes at the poles. The chief semidiurnal tidal constituents are the lunar constituent M2 with an interval of 12.4 hours and the solar constituent S2 with an amplitude approximately half as great and an interval of 12 hours. Short-period constituents have intervals of eight hours and less. Ocean tides. Changes in the tide-generating force cause changes in the gravitational force and in the magnitude and direction of the horizontal components of tidal forces and, consequently, in the direction of the plumb line as well. Influenced by these forces, the surface of oceans is impelled toward a position perpendicular to the plumb line, that is, varying in time at each point on earth. If the entire earth were covered by oceans and the water masses were able to achieve a state of equilibrium, as was initially assumed in Newton’s static theory of the tides, the moon’s influence would cause the spherical surface of the ocean to shift and assume the form of an elongated ellipsoid with the major axis directed toward the moon. Added to these shifts would be shifts corresponding to analogous ellipsoid deformations with the major axis directed toward the sun. The maximal rises and falls in sea level would then be only 0.5 m.
In actuality, the ocean does not cover the entire earth, and as the tidal wave moves it encounters obstacles in the form of continents and undergoes friction at the ocean bottom. Thus, reverse currents arise. As a result, the distributions of the amplitudes and phases of different tidal waves differ radically from the corresponding values presented in the static theory. Hence, the magnitude and nature of tides depend not only on the mutual position of the earth, moon, and sun but also on geographic latitude, the sea’s depth, and the configuration of the shoreline. In 1775, P. Laplace developed a dynamic theory of the tides based on the general equations of hydrodynamics. This theory made it possible to calculate the movement of tidal waves in the seas and oceans. The greatest elevation of the water is called high water and the low stage is called low water. When the height of ocean tides far from the continents is of the order of 1 m, the difference between successive high and low waters along the coast may be very great. In the Bay of Fundy off the Atlantic coast of Canada, for example, the height of tides reaches 18 m, and in Frobisher Bay off Baffin Island and at certain points along the English Channel it reaches 15 m. Tides reach 13 m in Penzhina Bay off the northeastern coast of the Sea of Okhotsk and 10 m in Mezen’ Inlet of the White Sea. A tidal wave entering the mouth of a river may cause the formation of a steep wave. Tide tables are published in the USA, USSR, Great Britain, Japan, and other countries to assist navigation, These tables contain figures on the height of tides in relevant ports for every hour of the year. The movement of tidal waves on the high seas is determined by solving Laplace’s hydrodynamic differential equations on a computer with due regard for the configuration of the shoreline, the distribution of ocean depth, and the laws of friction against the ocean bottom. The solving of these equations makes it possible to prepare cotidal maps of the world’s oceans. Curves called cotidal lines are drawn on these maps to connect the points of a wave with identical phase, for example, the position of the crest of the given tidal wave for each hour. Another system of curves connects points with identical amplitude for the given wave. The most detailed cotidal maps for the four basic tidal waves M2, S2, K1, and O1 were compiled by K. T. Bogdanov and V. A. Magarik in the USSR. Ocean tides deflect the elastic body of the earth with their pressure, and therefore a familiarity with cotidal maps is essential when interpreting observations of bodily tides. Bodily tides. The earth too is deformed through the action of tidal forces; these deformations are called bodily or elastic tides. The movement of elastic tidal waves causes vertical displacements of the earth’s surface reaching 50 cm when the moon and sun are positioned at the zenith or nadir and horizontal displacements reaching 5 cm. Tidal changes in the force of gravity at the equator reach 0.25 milligal, changes in the plumb line reach 0.01”, changes in the slopes of the earth’s surface— that is, in the angle between the earth’s surface and the plumb line— reach 0.02”, and tidal extensions and compressions of the earth’s surface layers are of the order of 10–8. Volumetric deformations during bodily tides are manifested by periodic changes in the water level of pits and wells and in the level of lava in volcanoes, as well as by changes in the flow of some springs. Long-period tides deform the earth and change its rotational velocity. This is revealed by comparing astronomical time, determined on the basis of the earth’s rotation, with atomic time. The magnitude of all these tidal effects depends on the internal structure of the earth, that is, on the distribution of densities and of the elastic properties of different layers of the earth at all depths, from the surface to the center. Thus, observations of bodily tides make it possible to study the internal structure of the earth. The theory relating the observed phenomena of bodily tides to the internal structure of the earth was developed by G. Takeuchi (Japan), H. Jeffreys (Great Britain), and R. Vicente (Portugal) and most extensively by M. S. Molodenskii. Specifically, the phenomenon of resonance between certain diurnal bodily tidal waves (K1 and others) and the diurnal nutation of the earth was theoretically predicted as a result of the liquid state of the earth’s core. This theory was confirmed by observations of tidal changes in the force of gravity and in tilts. Measurements of tidal changes in the force of gravity as well as the study of the global characteristics of the earth’s structure make it possible to study deep-seated regional irregularities in the earth’s mantle. These data are essential for gravimetric surveying for geodetic purposes, in geophysical exploration of useful minerals, and in the study of temporary changes in the force of gravity. Measurements of tidal tilts indicate that these tilts depend on local characteristics of the structure of the earth’s crust; such measurements can be utilized in the study of the block structure of the crust and of deep-seated fractures. Atmospheric tides. Together with diurnal fluctuations in air temperature, the atmosphere experiences very minor diurnal and relatively intensive semidiurnal changes in surface atmospheric pressure. It is difficult to identify such changes when there are intensive and irregular changes in weather. These variations are greatest in the tropical zone (about 1 millibar for the semidiurnal component) and decrease sharply in the temperate and high latitudes. Although the tidal forces of the moon are more than twice as great as those of the sun, solar tides predominate over lunar tides in the atmosphere, unlike tides in the sea and earth. Recent investigations of the upper atmosphere have explained this. The atmospheric tides, with an interval equal to half of the solar day, are caused primarily by the thermal, not gravitational, effect of the sun on the atmosphere. Ultraviolet solar radiation absorbed by the ozone in the stratosphere causes these layers of the atmosphere to become warm. This in turn stimulates fluctuations of such meteorological elements as pressure, temperature, density, and wind velocity; the fluctuations have such intervals as 24 and 12 hours. Most of the energy of the diurnal component is exerted on waves that are not transmitted from the upper atmosphere to the earth. This explains the very minor diurnal fluctuation of atmospheric pressure at the earth’s surface. By contrast, the semidiurnal fluctuations are transmitted to the earth and therefore their amplitude at the earth’s surface is much greater. Atmospheric tides play an important part in the dynamics of the upper atmosphere. Diurnal and semidiurnal changes in parameters at great altitudes are so large that without a knowledge of them it is impossible to calculate the movement of man-made objects in the upper atmosphere. Cosmogonic role of tides. The existence of friction or viscosity in the case of bodily tides and the presence of complex continental boundaries in the case of sea tides cause the tidal crest to be borne forward in the direction of the earth’s rotation with the crest’s axis not oriented exactly toward the tide-generating body. If this occurs when the planet revolves more rapidly than its satellite, as with the earth and the moon, the forces operating from the moon (the satellite) on the tidal deformation of the earth (the planet) produce a force couple that retards the earth’s rotation. On the other hand, the action of tidal deformation on the moon causes the moon (the satellite) to move away from the earth. This secular retardation of the earth’s rotation was predicted long ago by G. Darwin. Modern calculations of tidal retardation of the earth’s rotation indicate that most of the retardation is caused by ocean tides. Bodily tides also retard the earth’s rotation, but much less than ocean tides. The total tidal retardation of the earth’s rotation should be approximately 3.5 msec per century, although astronomical observations indicate that during the last 2,000 years the day has grown longer by an average of 2.0 msec per century. Therefore, there are factors, as yet unexplained, that are accelerating the earth’s rotation by approximately 1.5 msec per century. Under the influence of tides, the moon is moving away from the earth at a rate of 3 cm a year. The influence of tides causes the moon to face the earth with one side and also causes the slowness of Mercury’s rotation. Cosmogony studies the effect of tides on changes in the moon’s orbit— its positions and dimensions— relative to the earth. The relation between fluctuations in sea level and phases of the moon was observed in ancient times. The first static theory was devised by Newton (1688) and developed by his followers D. Bernoulli, C. Maclaurin, and L. Euler. Laplace’s dynamic theory of the tides (1775) was refined by the British scientists G. Airy (1848), W. Thomson (Lord Kelvin, 1895), and G. Darwin. Numerical methods of predicting sea tides were refined by the British scientists A. Doodson (1928) and D. Cartwright (1973). Methods of analyzing bodily tides were developed by Doodson, R. Lecolase (France), B. P. Pertsev and P. S. Matveev (USSR), and A. P. Venedikov (Bulgaria). The evolutionary and cosmogonic importance of tides was first studied by G. Darwin (1911). The first observations of tides in Russia date from the early 18th century. In 1848, F. P. Litke published a cotidal map of the Barents Sea. A. M. Bukhteev and V. S. Stakhevich worked on observations of tides that were made until 1907. The works of the Soviet scientists Iu. M. Shokal’skii, V. V. Shuleikin, L. N. Sretenskii, N. E. Kochin, N. P. Vladimirskii, A. I. Duvanin, B. A. Kochan, K. R. Bogdanov, and V. A. Magarik are devoted to the study of sea tides. A. Ia. Orlov initiated the systematic study of bodily tides in the USSR, using tiltmeters at first and later gravimeters; Orlov established the Poltava Gravimetric Observatory for this purpose. The works of such Soviet scientists as M. S. Molodenskii and N. N. Pariiskii have contributed substantially to the study of bodily tides. The cosmogonic significance of tides and their effect on the moon’s orbit have been studied by the American scientists G. J. F. MacDonald, P. Goldreich, and W. Cowell and by the Soviet scientists A. S. Monin and E. L. Ruskol. Shokal’skii, Iu. M. Okeanografiia. Leningrad, 1959. Duvanin, A. I. Prilivy v more. Leningrad, 1960. Lamb, H. Gidrodinamika. Moscow-Leningrad, 1947. (Translated from English.) Chapter 8. Molodenskii, M. S. “Uprugie prilivy, svobodnaia nutatsiia i nekotorye voprosy stroeniia Zemli.” Tr. Geofizicheskogo in-ta AN SSSR, 1953, no. 19. Pariiskii, N. N., M. V. Kuznetsov, and L. V. Kuznetsova. “O vliianii okeanicheskikh prilivov na vekovoe zamedlenie vrashcheniia Zemli.” Fizika zemli, 1972, no. 2, page 12. Siebert, M. “Atmospheric Tides.” In Advances in Geophysics, vol. 7. New York-London, 1961. The periodic rising and falling of the oceans resulting from lunar and solar tide-producing forces acting upon the rotating earth. 249) the court held that the term "high seas" was applicable to the open, uninclosed waters of the Great Lakes between which the Detroit River is the connecting stream, notwithstanding the water of the Lakes is fresh and tideless. DOHSA's reach: what are the high seas beyond a marine league from shore? In tideless seas, in which sea level is not expected to vary so much, these phenomena (which usually occur in summer, although they are unpredictable) cause damage to boats moored in small ports or at anchor in sheltered coves. The future we face is as bleak as a starless sky, a tideless sea. This is death then, a blank where no thought flowers, a pit of black tideless water, where no fish kill. The Mediterranean is a virtually tideless sea, because by the time some of the high tidal water flows through the narrow Strait of Gibraltar and raises the sea level a couple of inches, it is time for it to flow out again. I have no sister no mother no children left only a tideless ocean of moonlit women in all shades of loving learning the dance of open and closing learning a dance of electrical tenderness no father no mother would teach them.